HEREAS AGES AGO in theirquest for supematural aid the Greeks swore by Aesculapius, son of Apollo, god of health； and by Hygeia, goddess of health: and whereas the Romans in the Christian era placed themselves under protedion of ApoIlonia，whose help as Dentistry's patron saint they besought，so　now do l humbly ackllowledge my human limitations　and solemnly swear to render health service to those who seek my ministrations and to accept some responsibility for the care of the needy. l also enjoin upon myself the sacred duty of teaching the public， particularly children and young people, by precept, lecture, alld every other available mode of instruction, the value of oral helth as a priceless possession ; and further bind myself by future study to broaden my knowledge that l may share with others such information in my special field as will tend toward the ideal of oral health. 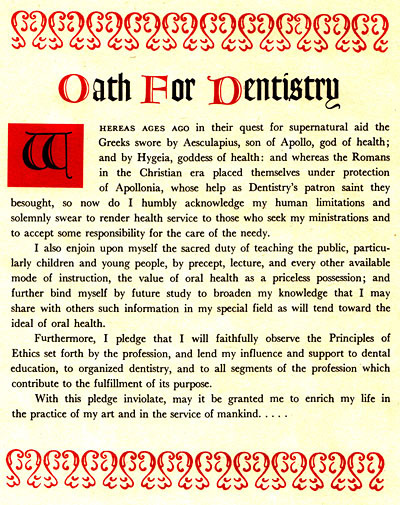 Furthermore, I pledge that l will faithfully observe the principles of Ethics set forth by the profession, and lend my influence and support to dentaleducation, to organized dentistry, and to all segments of the profession which contribute to the fulfillment of its purpose.